fantastic…. 3 weeks without tights, pin curls, wigs, fake eyelashes, or heels is MAGICAL! 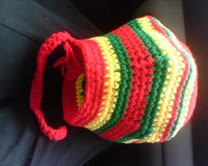 and… a Rasta hat for my sis’s dog! She and her fiance asked for one… I think it looks more like a chef hat, but, hopefully once Tanks little beagle head is under it, we’ll all be singing songs of freedom. Last night, we had dinner at a lovely Waffle House and stayed at a glamourous Motel 6. In the morning we found a Starbucks in an Oklahoma City Mall. It was at that Starbucks when I heard my favorite road trip quote so far. Elderly Oklahomian: I’ll have a… a… grande… a whaddya call it… le-TAH? Bless the Oklahoma latte men! They made me smile.